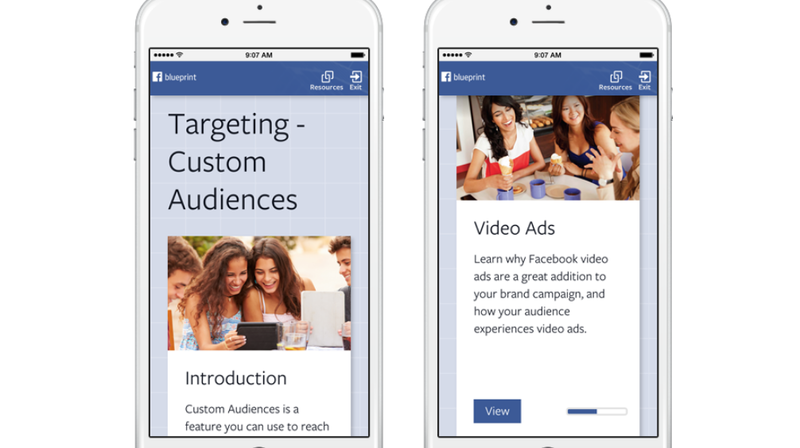 Earlier this year, Facebook launched Blueprint, an education program that trains agencies, partners, and marketers on how to use Facebook to create better campaigns that “drive business results”. It includes online courses as well as in-person training and certification. The company just made an update to the program, which enables those taking courses to more easily share their progress with those concerned with it. As a valued participant in the Facebook Blueprint eLearning program we wanted to let you know that you can now share your Blueprint progress with your Agency or Business. Next time you access Blueprint you will have the opportunity to opt-in to share your information. You may elect to stop sharing this data with the Agency or Business by updating your Blueprint profile at any time. Blueprint launched with 40 learning paths/modules, and you can use it from the desktop or mobile. It’s available to anyone with a Facebook account. You select the courses you want to take, and take them at your leisure. We took a closer look at what all is available in Blueprint here.